Certain genre fans will have nostalgia, not only for oddball films that might not stand up to the test of time, but for special effects from those films. When I've shown friends the original DAWN OF THE DEAD a common comment is that the blood looks fake. I grew up with that melted crayon looking blood and it holds a special place in my heart. It doesn't have the same effect as CGI squibs exploding into the camera lens but it does have a tactile nature that computers haven't been able to replicate. I was aware that Tom Savini did the makeup for EFFECTS, but I was genuinely surprised when I saw a blood effect from DAWN OF THE DEAD in this film. It would be like taking a drive through Pittsburgh and accidentally happening across the Monroeville Mall. I was taken back to a middle school version of myself, but while watching something I've never seen before. 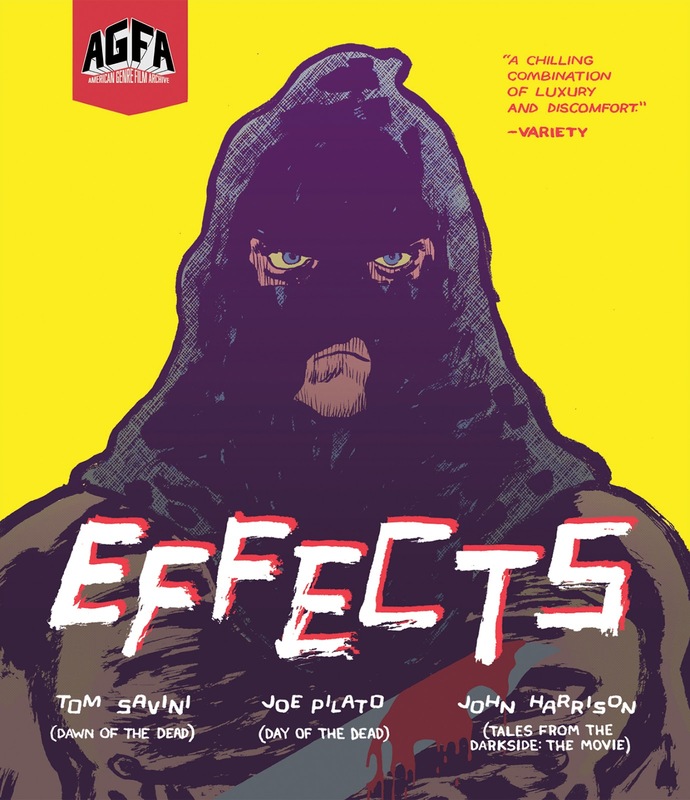 Cobbled together with loose change by George Romero's friends, EFFECTS is a mesmerizing D.I.Y. frightmare that no one talks about, but everyone should. A group of coked-up filmmakers -- including Tom "DAWN OF THE DEAD" Savini, Joe "DAY OF THE DEAD" Pilato, and John "TALES FROM THE DARKSIDE: THE MOVIE" Harrison -- gather in Pittsburgh to make a slasher. As filming begins and "accidents" happen, it's clear that something isn't right. And no one can be trusted. Landing somewhere between SNUFF and a student film by John Carpenter, EFFECTS is a meta-enhanced takedown on the philosophy of horror that doubles as a sleazy and terrifying movie on its own. Thought to be a lost film, EFFECTS has been painstakingly restored for this Blu-ray release with a 4k scan from the only known 35mm theatrical print in existence. It might not succeed as a film on its own but the history behind the film and the people involved elevate it to something special, a crayola-blood soaked time capsule. This is not a traditional slasher fan for the casual fan. No, this is an experimental gore fest that is a must see for any Romero fan. In the wake of Romero's passing it was good to sit down with a film that felt like it was from his universe. -Liner notes by Joseph A. Ziemba of AGFA and Bleeding Skull! You can pre-order your copy of EFFECTS through the MVD shop here.